Malibu Has done it again with the new 2014 Wakesetter 22MXZ, just a great all around performing boat. and with surgate you can get that surf wave you have been dreaming of. Not to metion the Power wedge, factory ballast,with plug and play for even more weight,and so much more. 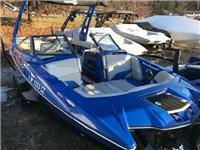 I am interested in your 2014 Malibu WakeSetter 22mxz and would like more information. Please let me know. Thank you!